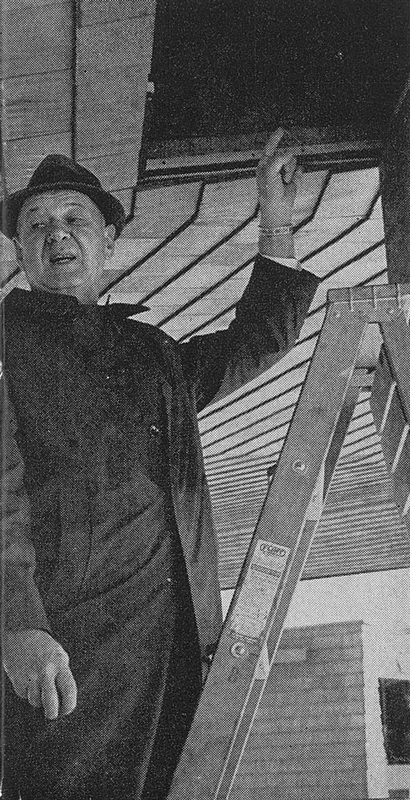 Ernest Trombley, who designed the oil storage and handling system, points to fill connections between floor of living quarters and ceiling over patio. 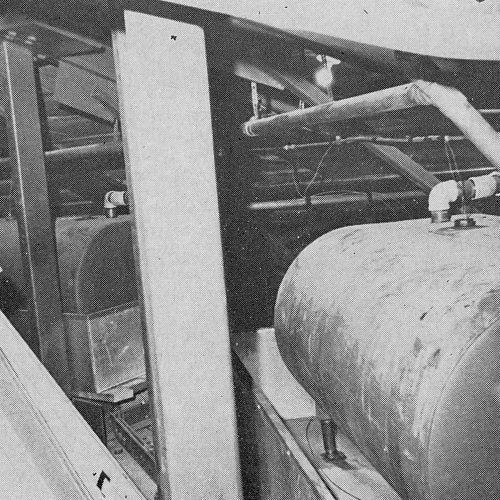 OIL STORAGE TANKS in attic sit in metal pans, each sized to hold 110% of the tank’s rated capacity. A structural framing is steel. 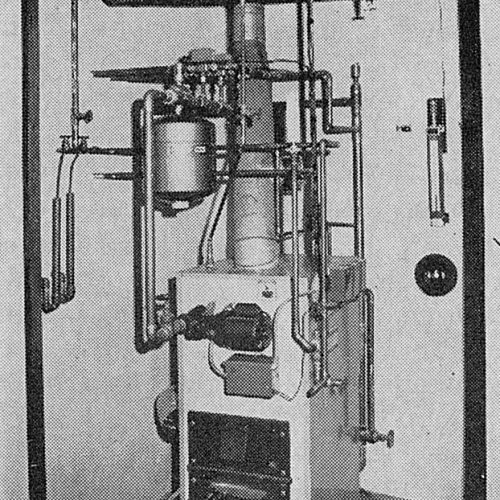 BOILER ROOM is located in revolving unit, between the dining room and the circular center hall. 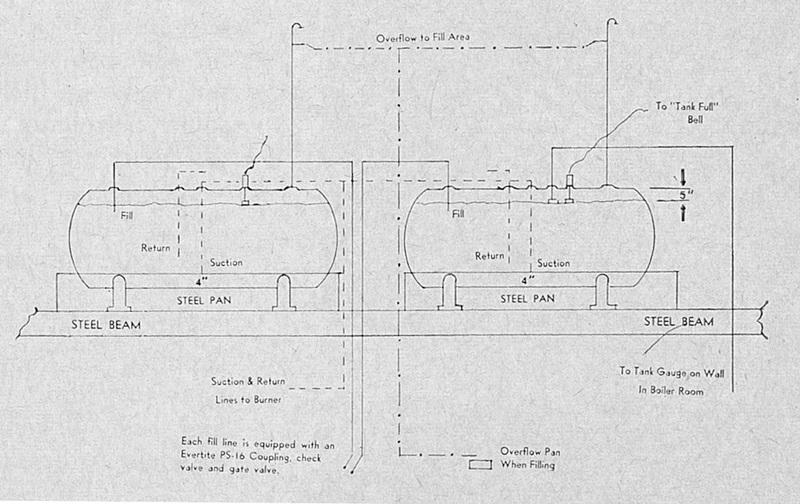 Simplified diagram of oil storage and handling system with tanks in the attic and fill in the ceiling of the overhanging, revolving section. 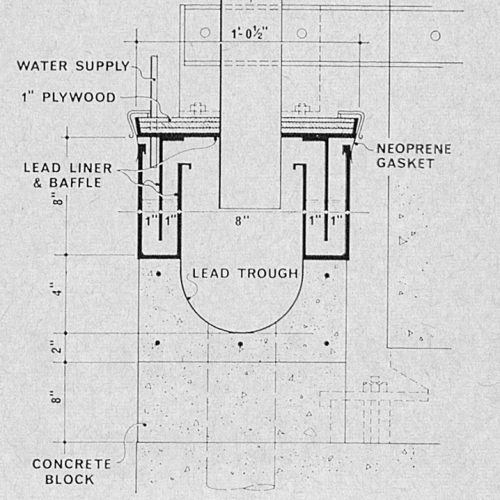 Detail in sketch shows air flow through the under floor fin tube radiator assembly. The heating system, plumbing and oil tanks revolve as a 1.5 hp. motor turns the Foster home clockwise or counter- clockwise at any one of ten speeds. 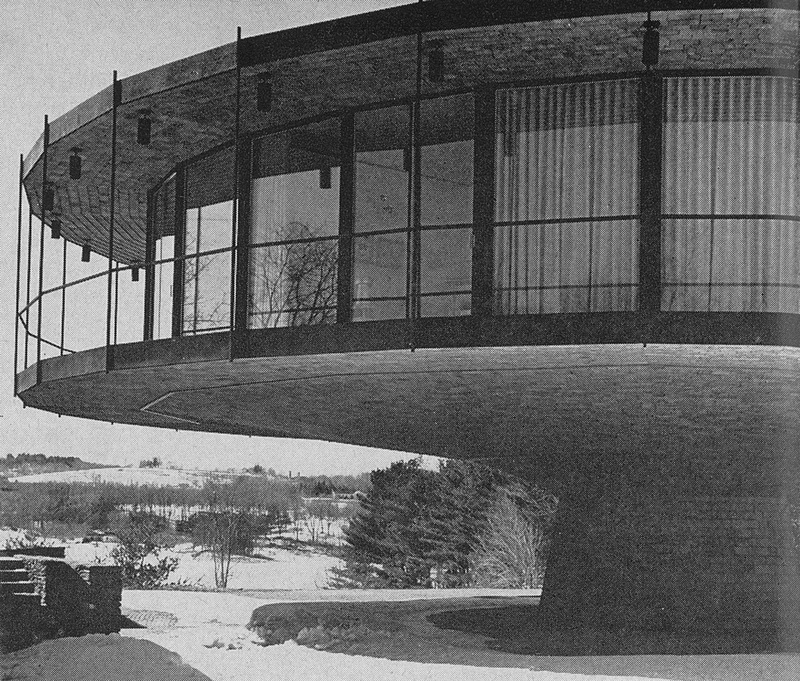 It has been called “ultra-modern” and “breath-taking,” and it would be a strong contender for the world’s most spectacular home. Built last year on the outskirts of Wilton, Connecticut, to house the family of architect Richard Foster, it incorporates the ultimate in design, materials and equipment—including a modern oil powered hydronic heating system. 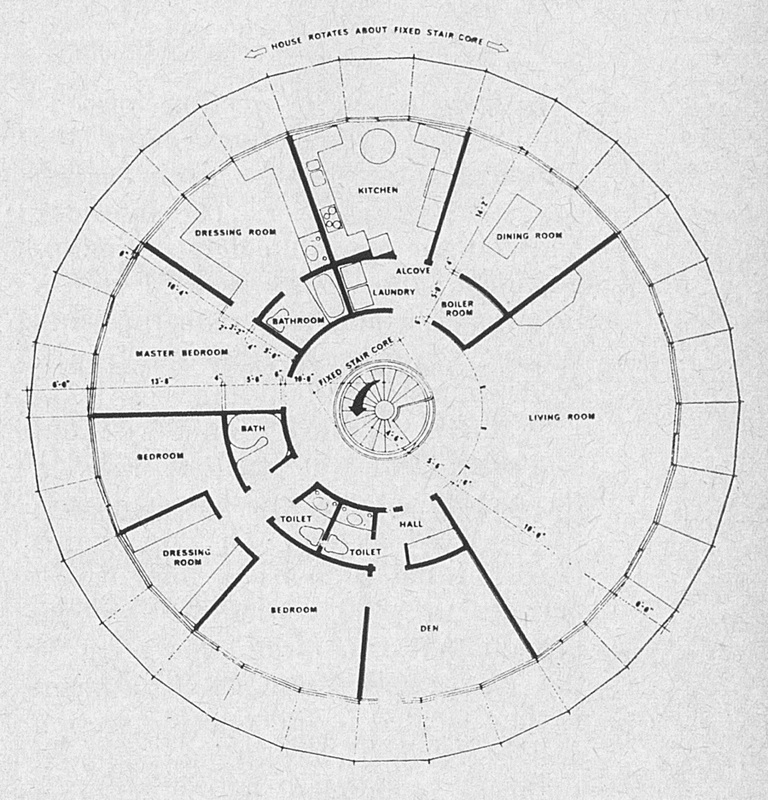 “It” is a glass and steel circular structure mounted on a powered turntable similar to those used in railroad roundhouses and perched on a pedestal which contains the only door, the entry hall, and a circular stairway to the living room. The house revolves around the fixed stair and a center column which carries utility lines to the attic, from whence they are distributed to the living areas. But the heating and oil storage system are in the revolving portion, and the first step in making an oil delivery is to make sure the house is stopped. The architect-owner specializes in school and college work, with offices in midtown Manhattan. 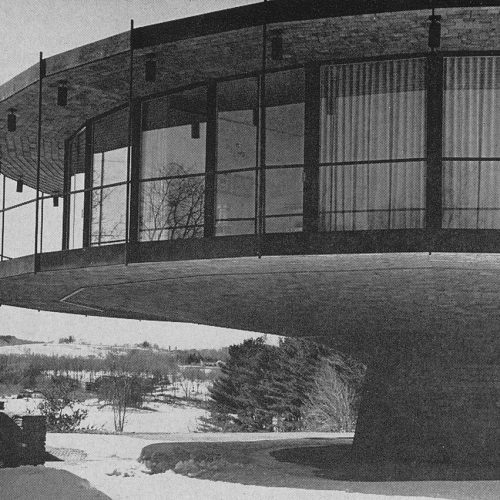 The revolving home resulted from the family’s inability to decide which of many spectacular views from the six-acre site should be framed by the windows of the principal rooms. There’s an apple orchard in bloom in the spring in one direction; distant hills a mass of fall color in another, and meadows, a pond and a reservoir in between. The famed Top Of The Mark in San Francisco is one of a number of cocktail lounges and restaurants which also revolve, but the mechanical facilities are usually in a stationary segment. The Foster home is very un-usual in that bathrooms, the kitchen and the complete heating system are in the mobile section. This is made possible by a number of ingenious systems designed by Mr. Foster and his mechanical engineer, Meyer-Strong-Jones of New York City. 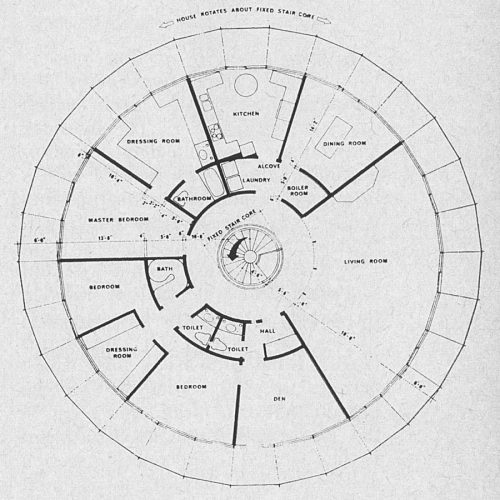 A control panel mounted on the stairwell permits the house to be moved clockwise or counterclockwise at ten speeds ranging from five turns a day to one turn in 48 minutes. The drive mechanism is powered by a 1.5 hp. motor and operates so smoothly you can detect motion at the highest speed only by keeping an eye on some fixed outside object, such as a tree. The bearing and drive mechanism was supplied by Rotek. There is nothing unusual about the heating system. 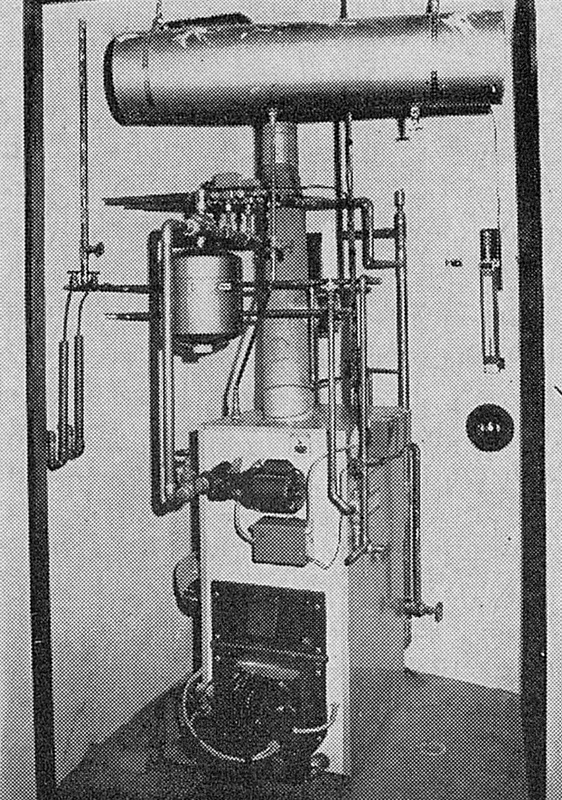 The Crane oil boiler, in a utility room between the dining room and the circular center hall, supplies heat and domestic hot water from a tankless coil. The Thermopane outside walls are blanketed by heat from a finned tube radiation under the floor, Figure 1, divided into three zones. Ceiling and floor are insulated with full-thick Fiberglas batts; calculated heat loss is about 115,000 BTU, and the boiler is rated for 130,000 BTU. 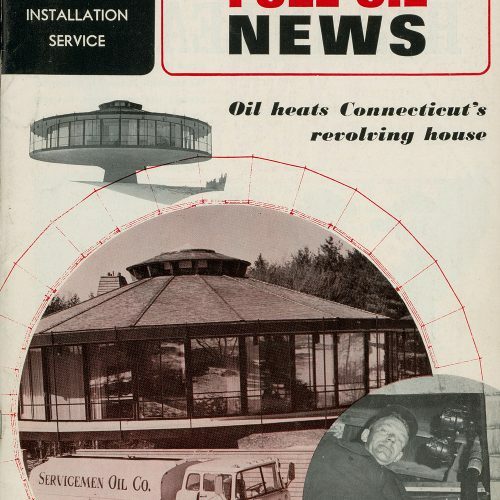 The very special oil handling and storage system was designed by Mr. Ernest F. Trombley of Meter and Tank Equipment Co., Inc., South Windsor, Connecticut. 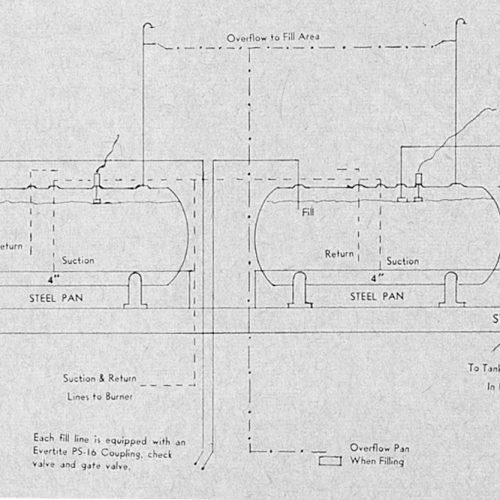 As shown in the accompanying diagram and photos, each of the two 275-gallon tanks in the attic rests on structural steel beams and sits in a metal pan which will hold 110% of the tank’s total capacity. When the oil level reaches a point 5 inches from the top, a “tank full” bell starts ringing as a signal for the driver to stop filling. 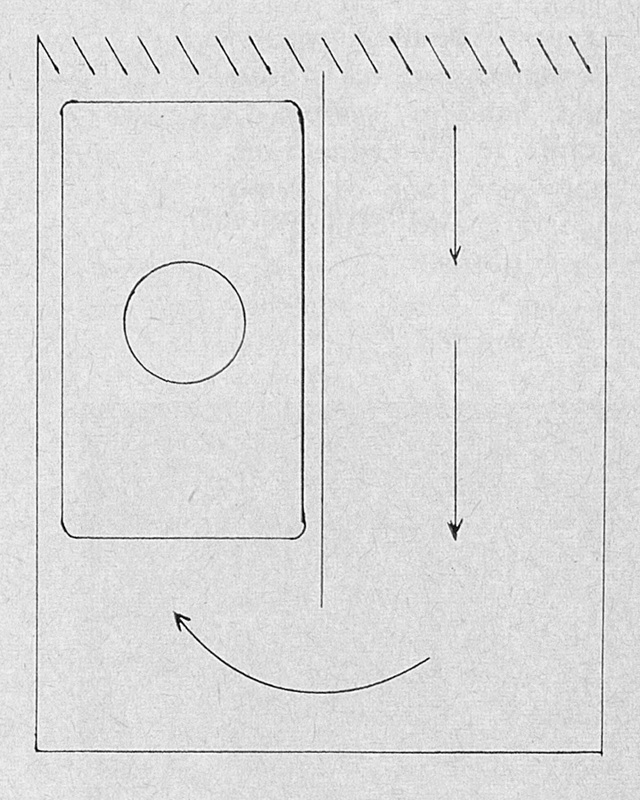 If the bell fails or the driver ignores it, excess oil would rise in the vent line, flow through the overflow lines and land in a pan the driver is supposed to put under the overflow at the beginning of each delivery; if he forgets the pan and has an over-fill, the excess oil will land on his head. Suction lines which supply the burner stop 4 inches from the bottom of the tank. This reduces the usable capacity of the tank, but insures against any problem from foreign matter which may accumulate. A return line from the burner parallels the supply line. A tank gauge on the utility room wall indicates the amount of oil in reserve at any time. 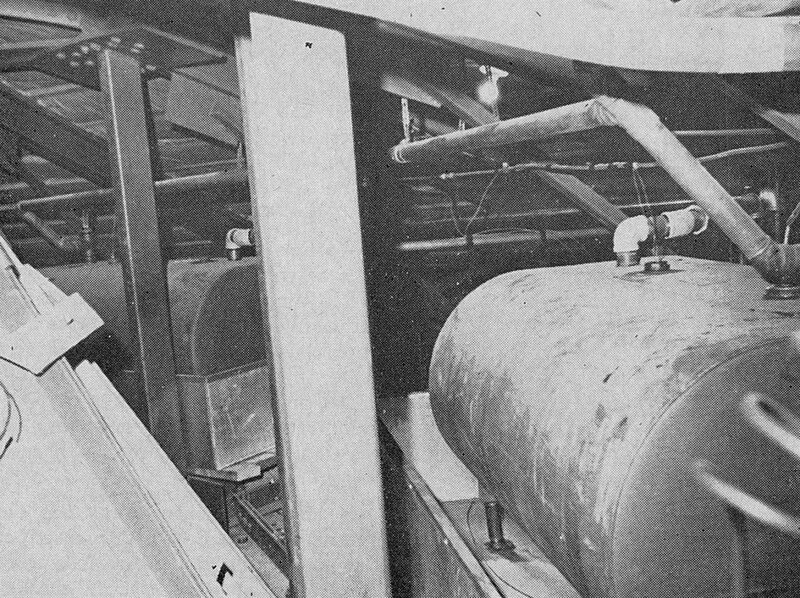 A trap door in the underside of the revolving section gives access to the fill connections for each of the two tanks. After making sure the house is stopped, the driver walks around the patio until he locates this door; he can then start his delivery. The business end of each fill line is equipped with drip-proof, tight-fill connectors which have been used for years in fueling aircraft and in some petroleum bulk plants. Thus far, deliveries have been uneventful. As another precaution, Model FS-200M Gems flow switches are installed to indicate any break in the line. 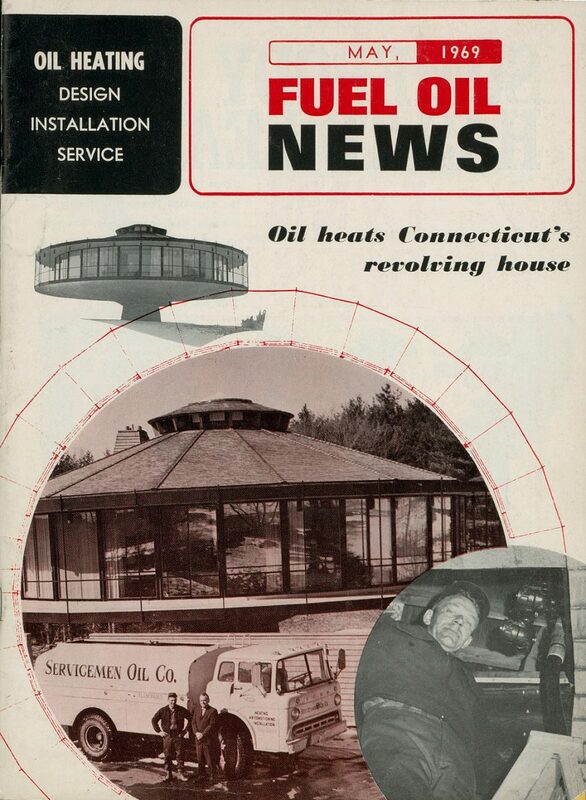 Oil and service for the system are supplied by Servicemens’ Oil Company of Wilton. Owners Jerry Morin and Bob Wakeman report only one problem to date; a shortage of combustion air in the small utility room was starving the burner but this was easily cured by installing a small fan. Jerry’s brother Leo is the driver who supplies oil to the home. 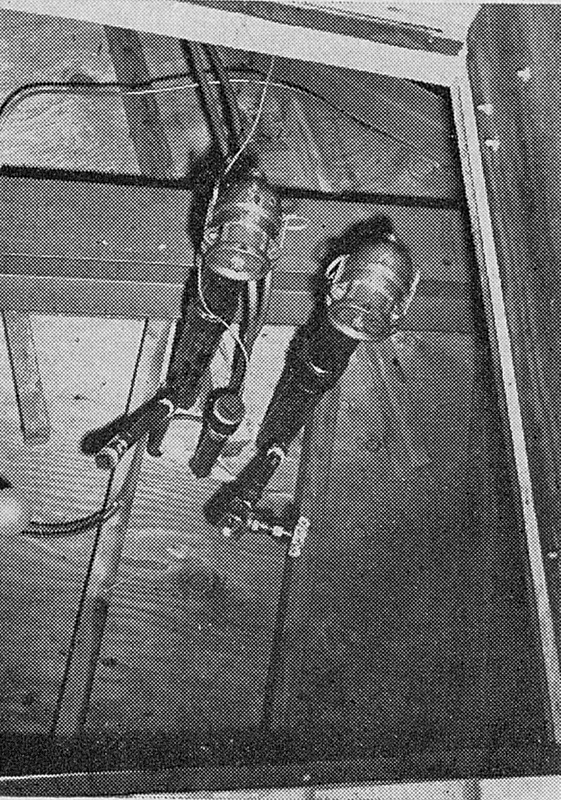 As noted earlier, the plumbing system is unique in that the fixtures are located in the rotating section of the house. 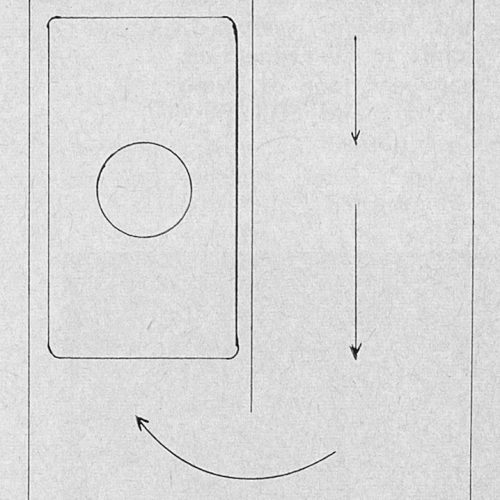 Because of this, it was necessary for Meyer-Strong-Jones to de-sign an enclosed trough (Figure 3) made up of two interlocking sections, one fixed (lower section) and one movable (upper section). 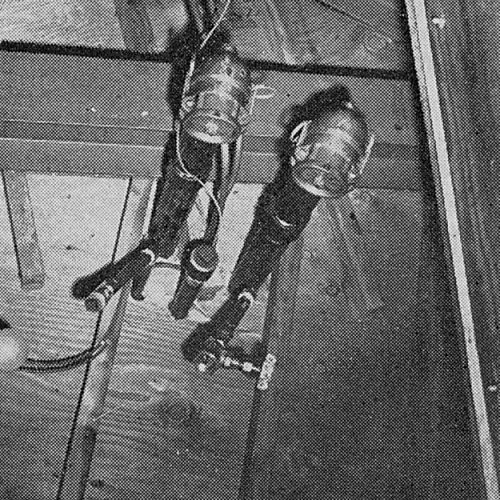 The soil and waste piping from the fixtures is connected to the movable section of the trough which in itself is fastened to the rotating portion of the house, thus permitting conventional piping to be used from the trough to the plumbing fixtures. From the fixed section of the trough, pipe connections carry the drainage into a house drain which connects to the sewer. 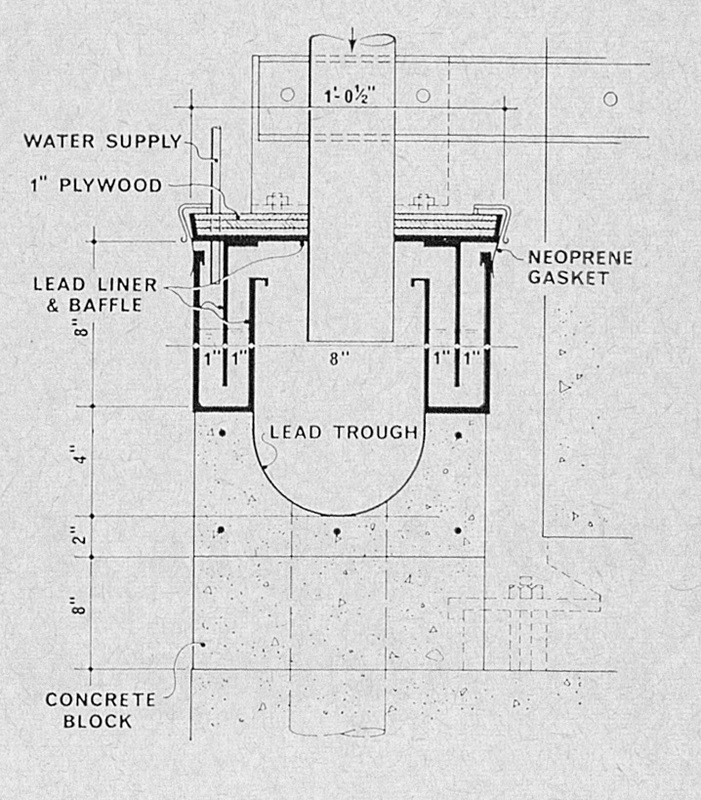 The interlock between the movable and stationary portion of the trough is filled with a liquid which acts as a seal, thus pre-venting sewer gases from the trough from entering the building. Water is supplied from a well and the main cold water supply rises in the exact center of the core which is in the fixed section. The top of this riser is fitted with a ball joint which permits a 360° rotation of the branch that runs from this point to the movable section. All equipment is then located in the rotating section and is fed in a conventional manner. Power is supplied to the building by means of a feed-rail bus system. The feedrail bus is attached to the moving section of the building and is formed to the required radius. The “trolley” section is on the fixed pedestal and remains in a relatively sta-tionary position, carrying current to the building via the bus. The bus is of 3-wire construction, providing 240/120 volts single phase current to the house panelboard. From this panelboard, electric wiring is distributed within the house. Telephone service is provided in a similar manner using a 2-wire feed-rail. 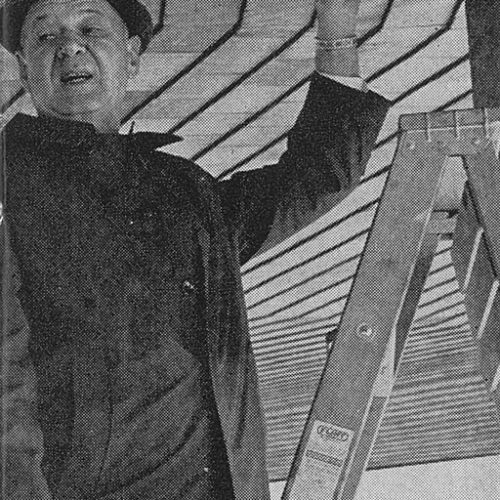 With the concept and the mechanical systems now tested and proven, Mr. Foster believes similar structures will he erected in areas of great and varying scenic beauty. Total cost has not been released, but educated guesses put it in the $250,000 class. At this price it would interest many families as well as the owners of restaurants, cocktail lounges and even motels in high grade resort areas.